“The mind that opens to a new idea never returns to its original size.” (Albert Einstein). First of all you have to get acquainted with the concept of open-mindedness; what is it and on what is it based. Secondly, you have to be aware about your own open or closed mind by doing small tests. Third, open-mindedness has to contribute to your competences in teaching or mentoring students from another country and culture, with other values and norms than you have. How can you open your mind? To reach these goals, you read theories, view video’s, make some assignments for yourself and discuss with your peers. This Indicator Chart is meant to give an overview on the content and the goals of the module. It also shows briefly the context in which Open-mindedness is important and which knowledge and skills are required. The meaning, the importance and the improvement of Open-mindedness will be explained, in 4 paragraphs: A. Metaphore, B. Transfer to Education, C. Definition and description, and D. Your position as a teachear or mentor. We will start with the “apple peeling metaphor”. Before reading or studying on this indicator, please take two minutes to see the Video “the Apple Lesson”. B. Transfer to Education We go back from this apple peeling metaphor to your own situation as teacher or mentor in Education, Rehabilitation and Health & Social Care. You may have experienced a certain personal preference how your students/trainees have to learn, have to behave or have to perform. C. Definition and description1 For multicultural competences, open-mindedness is a requirement, defined as having an open and unbiased attitude towards members of a group with other cultural norms and values. Open-mindedness is the readiness or preparedness to engage in and with the situation and the other person and the willingness to question or have questioned own action patterns and familiar viewpoints. Open-mindedness covers a willingness to question current thinking and practice, to be receptive to emerging possibilities, to share ideas and to consider differing perspectives. It is a willingness to learn about difference, and treat each person as an individual in a way that can ultimately reinforce behavioural understanding of culture. Listening to different opinions and explanations carefully and sincerely without prejudices. Open-mindedness is a mind that is open to revising firmly held views on the basis of evidence and having a respect for the opinions of other people, as well as understanding and comprehending their opinions. Open-mindedness within health and social care relates to the ability to draw attention away from social conditions and power differentials that underlie health inequalities. Open-mindedness is to have few or no stereotypic beliefs about cultural differences. It expresses the tolerance of the person for different approaches and sensitiveness for their own mistakes. In this dimension, the individual takes the opinions of other people into consideration as well, while making any decision. Whatever is strange should be regarded and evaluated not as a threat, but as enriching and enlightening. Open-mindedness means that you and the field can spell out new ideas that can mean the end of basic principles, underlying ways of thinking, canons and dictums that you and the field take for granted (Mahrer, 2007)2. It is vital to perceive others as different and as the same – something that is ruled out by both hierarchical ordering and universal equality. Whatever is strange should be regarded and evaluated not as a threat, as something that brings disintegration and fragmentation in its train, but as enriching in the first place (Beck and Grande, 2007, p.71)3. To show the importance of open-mindedness, next video demonstrates cultural competenses in nursing. Please see this video and focus especially on open-mindedness. Try to transfer the importance of open-mindedness from the nurse profession to your teacher/mentor profession, especially if it concerns foreign students or trainees. To understand this indicator better, it is advisable to read some literature on Open-mindedness. As a teacher or a mentor in an environment with foreign students and trainees in Education, Rehabilitation and Health & Social Care, you interact with people with different ages, cultures, languages, religions, spiritual beliefs, political persuasion, class, education, etc. In chapter ‘Culture’ you have seen two possibilties to test culture: Lewis and Hofstede. The main goal is to know who you are, your norms, values and beliefs and your position between the different cultures. Values, norms and beliefs influence not only your own behaviour, but also those of whom you teach or mentor. It is good to know these norms, values and beliefs and also to be aware of the environment you are in. It will assist you in the development of ‘good’ practices. Open-mindedness focuses on differences and “other” beliefs, which means different or other than your self. In addition, the importance of knowing how values/norm/beliefs of your students/trainees influence the interaction is evident and crystal clear. Do you have any idea how shocked your foreign students can be? In several videos students want to explain their “shock”, for example in the video’s about the American culture shock for international students, or about the international students who went to the Netherlands. Please see these videos. In your job as a teacher or a mentor cultural you may have noticed that cultural differences play a role in the interaction. Many aspects influence the interaction, like philosophy of life, attributions, orientation in time and space, humour, role behaviour, opinions about marriage and sexuality, religion, doing business. Awareness of the differences between you and ‘the other’ is crucial for the interaction. Taking these into account is even a step further. Reflecting on this and learning from it, is the goal of this programme. Therefore, you are asked to make next assignment in which you describe a situation and reflect on it. As mentioned in the definition and description, Open-mindedness is unbiased and without prejudices. This paragraph will focus on prejudices. Have you been a victim of prejudices your self? Have you noticed your own prejudices? How do you manage or reduce your prejudices? Prejudice is prejudgment, or forming an opinion before becoming aware of the relevant facts of a case. The word is often used to refer to preconceived, usually unfavorable,judgments toward people because of gender, political opinion, social class, age, disability, religion, sexuality, race/ethnicity, language, nationality, or other personal characteristics. In this case, it refers to a positive or negative evaluation of another person based on their perceived group membership. Prejudice can also refer to unfounded beliefsand may include “any unreasonable attitude that is unusually resistant to rational influence”.It can be defined as a “feeling, favorable or unfavorable, toward a person, prior to, or not based on, actual experience”. In next video you will see how to manage your prejudices. Open-mindedness is the readiness or preparedness to engage in and with the situation and the other person and culture.In communication and interaction with other people, open-mindedness is required from both sides. A good intercultural attitude expects open-mindedness from both sides and is not based on certain expectations and stereotypes. Foreign students are asked to be open, as well as the teacher and mentor. We ask foreign students to integrate in their host-country. But there is a difference between integration and assimilation. Integration arises when a group keeps his cultural identity in a way, but nevertheless completely participates in society. Assimilation means complete adaptation to the other culture. How far do we expect foreign students to integrate in the host-culture? The Johari window is often used for improving communication between people with different social and cultural backgrounds. The model refers to open-mindedness as well, in the way that we show ourselves and how the other sees and interpret our behavior. That is why this model is used in this chapter Open-mindedness. In next video you will be informed about the Johari Window. Have you ever been part of a team where everyone was completely open with one another? If so, then the chances are that you worked extremely effectively together. You knew your co-workers very well, and there was a solid foundation of trust and open-mindedness between you. As a result of this positive working environment, you probably accomplished a great deal with this group.Most of us realize that teams and groups rely on trust in order to function productively, but how do build that trust?The Johari Window is a model that helps you do this, it helps you to realize how open you are, what you know about yourself and what you want that other persons know about you. In this paragraph you will learn how the Johari Window works, and how you can use it with your student/trainee groups to improve communication and trust. See the Video of the Apple Lesson and describe briefly a situation in which you experienced: “my way is the only way”. You could have said this. If you don’t have this experience, maybe you recognize this in one of your colleague’s situations.After having seen the Video “Nurturing Cultural Competence in Nursing”, having focused on open-mindedness and tried to make the transfer, describe the importance of open-mindedness in your profession (teacher or mentor).After having seen the videos on cultural shocks, you have to reflect on your own situation, educating foreign students/trainees in your city and country. Maybe you have noticed that they were shocked in a way, when they came over to your city and country. Describe possible cultural shocks from your incoming foreign students or trainees. Describe a situation in your job (teacher/mentor) where cultural differences played a role in the interaction. Describe the differences between you and ‘the other’ as detailed as possible. Make use of a list of aspects (philosophy of life, attributions, orientation in time and space, humour, role behaviour, opinions about marriage and sexuality, religion, doing business, …). Mention in what way you should/could take these differences into account, if you happen to be in the same situation next time. For you personally: what are criteria to accept or not accept values and norms from other cultures? Do you handle a line of demarcation? This assignment is about your own experiences. Have you been a ‘victim’ of prejudices your self? Have you experienced your own prejudices? Foreign students are expected to integrate into the new country and environment. What is your opinion, as a teacher/mentor, having foreign students in your classroom or in your clinic on this issue? By giving examples, you can clarify your opinion. In which Area of the Johari Window can you find “prejudices”? Give concrete examples how you could enlarge your own Open Area of the Johari Window in your own professional life as a teacher/mentor in a group with foreign students. 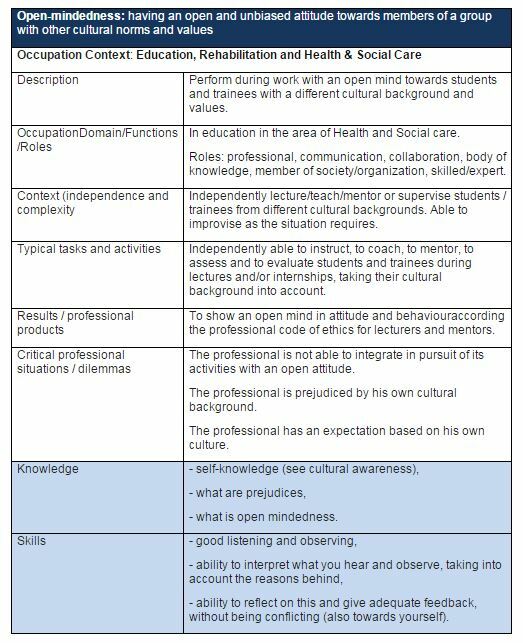 Give examples how you could facilitate and stimulate your students/trainees to enlarge their Open Area of the Johari Window?